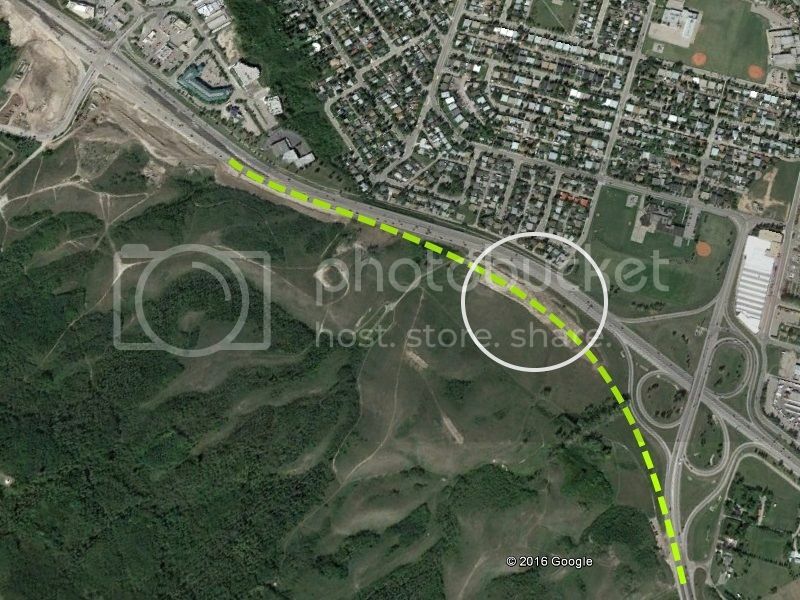 Alberta: Will the TCH be eventually rerouted onto the Sarcee/Glenmore Trails? If I'm seeing that right, is there a possibility that the TCH will be rerouted along both trails? I would be the best option for TCH-1 through Calgary, as it will result in an east-west freeway that would be shorter than the ring road. Re: Alberta: Will the TCH be eventually rerouted onto the Sarcee/Glenmore Trails? Huh? I don't see anything "defaulting" onto Sarcee Trail. Very disappointing it wasn't what I though. I was using Google Earth. I guess Google Maps hasn't been updated yet. Here's a screen grab. The circled area over the dashed line shows the area where the under construction appeared to be a realignment to me. We had some discussion about this in the past on Canroads mailing list. I think we might see a pattern similar to Winnipeg with a TCH-1 going thru downtown and TCH-100 who do the bypass job. Here a video showing how the interchange will look after the reconfiguration. I think that rerouting the Trans-Canada Highway along Sarcee/Glenmore Trails would make a lot of sense; while Glenmore Trail is not an interstate-grade freeway, it’s an 80 km/h 4-6 lane expressway/freeway with sufficient ROW to construct interchanges at the remaining signalized intersections. One of the largest problem spots at Ogden Road where it’s signalized, has a level crossing of the CP mainline, and splits into parallel one-way streets is currently being replaced with a diamond interchange and grade-separated railway crossing (see: http://www.calgary.ca/Transportation/TI/Pages/Road-projects/Glenmore-Trail-and-Ogden-Road-S.E.-Interchange-Project.aspx). It’s a significant improvement to 16 Avenue N, an arterial roadway. The one thing missing from this project is improved movement from NB Sarcee Trail to WB TCH (i.e. a 2 lane flyover). With the proposed West Ring Road, if TCH 1 were to follow Glenmore Trail, I wonder if it would follow Stoney Trail as opposed to Sarcee Trail?